What Is Cosequin for Cats? Cosequin's put a spring in my step -- though you wouldn't know it. If your older kitty has a hitch in his getalong, arthritis may be the culprit. The patented joint supplement Cosequin for cats can help keep kitty feeling spry. Although it's available over-the-counter, you should discuss any supplements you give to kitty with your vet. Manufactured by Nutramax Laboratories and often recommended by vets, Cosequin helps protect a cat's cartilage and joints. Available in capsules to mix in with food, Cosequin contains glucosamine and chondroitin sulfate. These natural substance support joint health and keep cartilage in good condition. The dose includes tuna and chicken flavoring for palatability. Arthritis often comes on subtly. The older your cat, the more likely he is to suffer from arthritis. You may notice Kitty isn't as active as he once was. For instance, you used to scold him for climbing on the counter or other high places, but he doesn't do that anymore. Did he learn his lesson after all these years or is there some other reason? Maybe he's having a little trouble walking, especially when getting up from a nap. He might be getting grumpy and cranky, acting like a little old man rather than the vigorous cat you remember. Cosequin helps put a bounce back in his step -- maybe he'll even jump on the counter again. Although most cats tolerate Cosequin without any problems, a few cats experience diarrhea or nausea from the supplement. This might also occur because you're giving too much Cosequin to the cat. If your cat weighs less than 10 pounds, don't give him more than one capsule daily. Larger cats need larger doses, but keep an eye on the litter box for signs of loose bowels. Always discuss dosages with your vet. 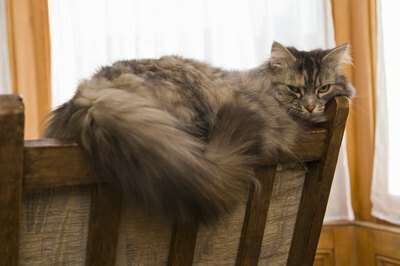 Some vets recommend Cosequin for cats with bladder issues. According to Nutramax Laboratories, "The inner lining of the bladder wall is protected by a layer, which contains some of the same compounds as are found in cartilage." Chrondroitin sulfate helps protect this layer, preventing urine from seeping through and damaging the bladder's lining. If you're lucky, kitty will eat the capsule right out of your hand. Most people aren't that lucky, but many cats will eat flavored Cosequin when it's sprinkled on top of their food, rather than mixed in. That makes life easier, so try sprinkling it first; if Kitty isn't interested, go the mixing route. What Is Feliway for Cats? Do Cats Chew on Cables? What Are the Causes of Stomatitis in Cats? Is There Any Kind of Nerve Pills for Cats? Can You Put FIV Cats With Non-FIV Cats?